Hot & Sour Soup – Damn Life is Good! I don’t know how it happened but we have found ourselves in Monmouth without a single Chinese takeout restaurant, and that is just tragic. 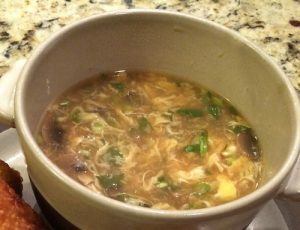 Here is a super tasty recipe for Hot and Sour Soup. We are not vegan or even vegetarian but you could easily adapt this recipe to fit your needs. It is really good. I mean, REALLY, really good. Serves 4 or so. In large pot, combine broth, soy sauce, red pepper flakes and two cups water. Bring to boil over medium heat. Add mushrooms. reduce heat and simmer until tender about 12 minutes. In a small bowl, whisk together vinegar and cornstarch. Add to pot and simmer, stirring until thickened about 2 minutes. Stir broth then add the eggs through a slotted spoon and stir until ribbons form. Stir in the tofu. Turn down heat to low and let stand for a couple minutes. Add garnishes. Serve, then strut your stuff. Because, OH, this is a damn good soup!